Further to the posts below, my second B. macrostachya (from Edulis Nursery) has flowered. B. aff. macrostachya PAB4198 is fast growing and tall, but the flower buds did not form until late in the season. 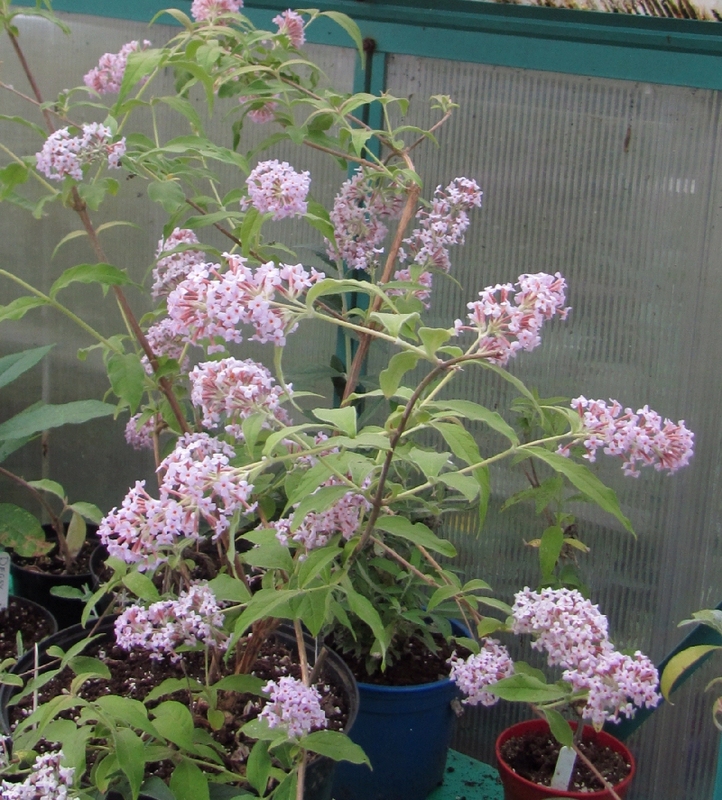 I have brought it inside to get the buds to open and it has filled the house with its aniseedy scent, which is somewhat similar to the putative B. paniculata GWJ9286 (see below). No doubts about this one - it is the species macrostachya. It has the characteristic tomentose ovaries and also a velvety exterior to the individual flowers; the corolla tube is quite long compared to B. forrestii. I have no idea how hardy this plant will prove to be and it will have to be planted outside as it grows too tall for my greenhouse. Returning to the subject of B. paniculata GWJ9286 (see below for more details) I have been undertaking a literature search to uncover some of the species that Leeuwenberg sunk under B. macrostachya and B. forrestii. Previous to Leeuwenberg (1979) the most authorative source was C.V.B. 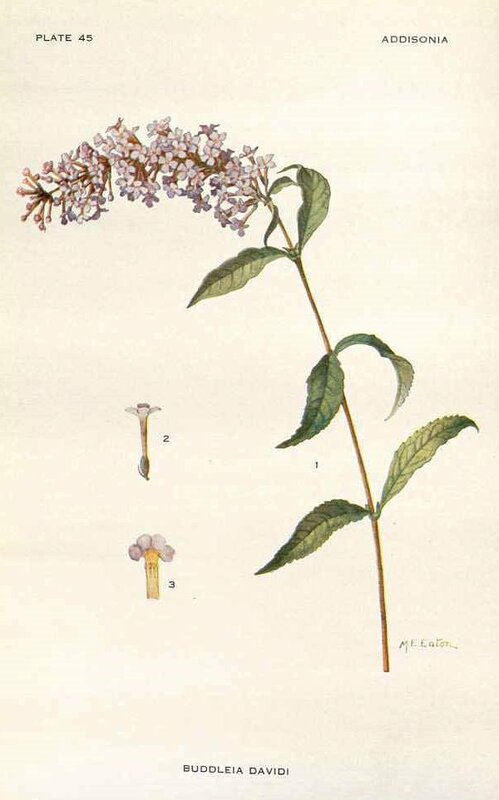 Marquand's Revision of the Old World Species of Buddleja (1930 Bulletin of Miscellaneous Information No.5 pp177-208. Royal Botanic Gardens, Kew.). Some redundant names are still in use, such B.limitanea and B pterocaulis, but others have been forgotten. 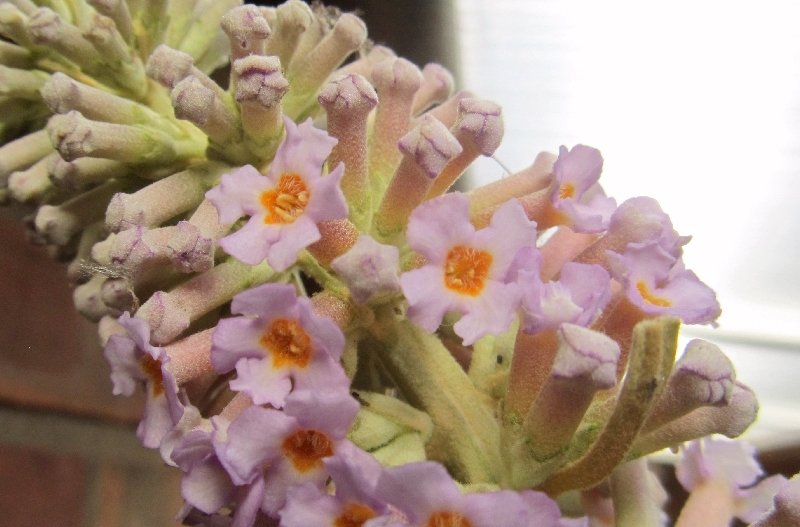 One previously recognised species was Buddleja hookeri, now sunk under B. macrostachya. Marquand's description of B. hookeri (available here) is remarkably similar to GWJ9286 in many respects - small calyx, tomentose ovary and corolla tube, lax flower panicle and subterete (rounded) stems. 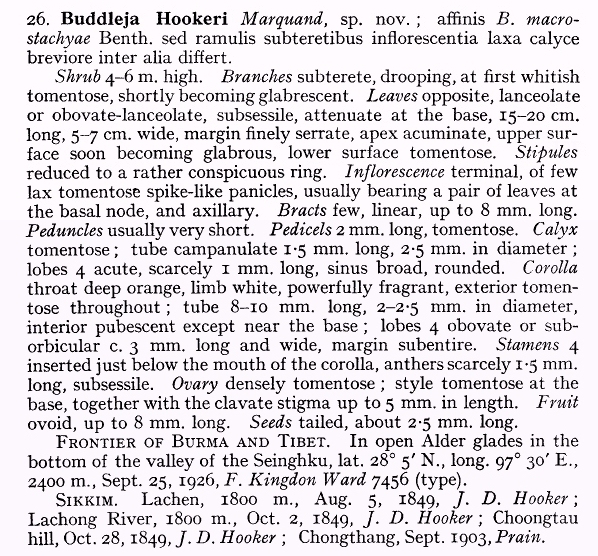 Moreover, the original report cites the Lachen Valley, Sikkim (northern India) as the source of the B. hookeri holotype, the same location from which GWJ9286 was collected. I can't be 100% sure, but the literature (and the scent!) does point towards GWJ9286 being a form of B. macrostachya. 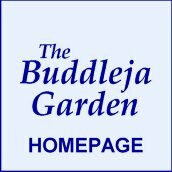 The Buddleja Garden is Five Years Old! 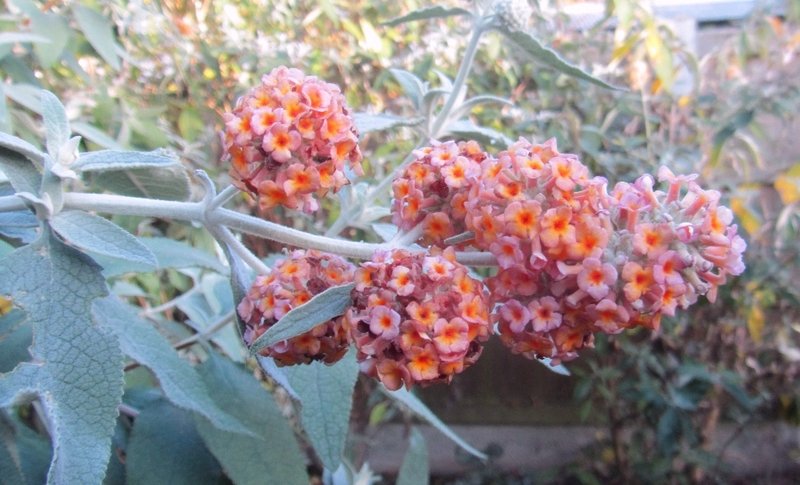 Five years of keeping a Buddleja Diary and steadily building up the website. And each autumn I am bowled over by the late Salmon Spheres flowers - and this year is no different; it's a reliable plant. So here is this year's photo of Salmon Spheres in the November sunshine. 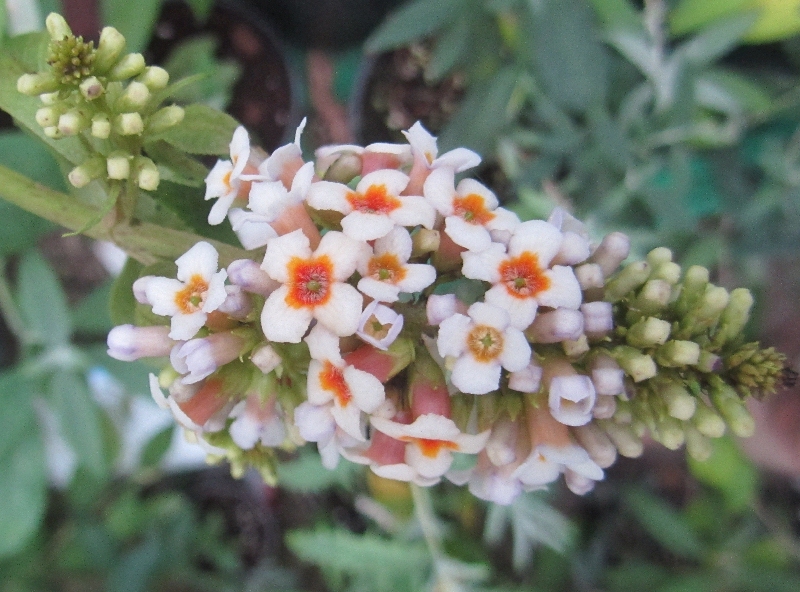 I have been waiting for this plant to flower, the B macrostachya from the National Collection. Only a very poor flower, late in the season and from a small plant. However, the flowers can still be compared to those the the putative B. paniculata (GWJ9286) and to B. forrestii (see below). After carefully examining the flowers I am pretty sure this is in fact another form of B. forrestii and not the authentic B. macrostachya I had hoped to use to confirm my identification of GWJ9286. My reasoning: the first impression is that the flower is very like my B. forrestii, off-white with a lilac flush in the buds and a large yellow eye. The corolla tube is short and fat, the exterior of which is not particularly tomentose. Dissection of the flower revealed the ovary and style are glabrous, whereas in B. macrostachya these are hairy. The stamen filaments are very reduced (subsessile anthers). I have another possible B. macrostachya whose flower-buds have formed, but it is probably too late now for these to open. 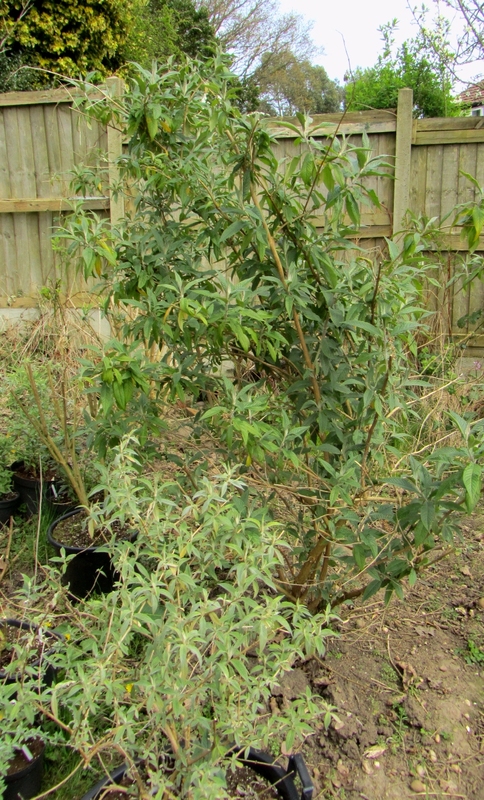 Last year I was able to secure a plant of Buddleja paniculata GWJ9286, a cultivar that was raised by Crûg Farm Plants in North Wales from seed originating in Sikkim (northern India). The plant is a good'un. Good foliage and highly scented flowers that appear in late summer, which are white or can appear pale lilac in certain lights. Hardiness is untested, but I have been told it should survive the UK climate in a sheltered spot. It also appears to be highly self-fertile. 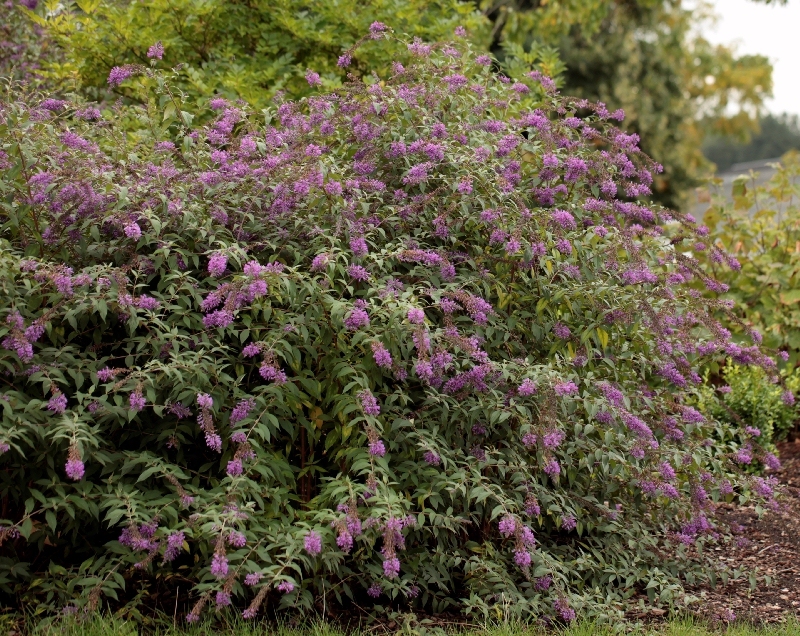 As mentioned before, assigning Buddlejas to a particular species can be difficult. 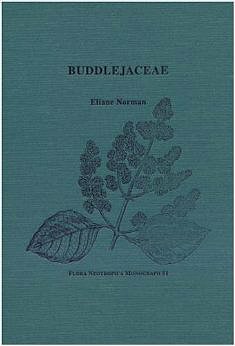 The bible on Asian Buddleja identification is a monograph by Leeuwenberg published in 1979. It's rather technical, contentiously lumps many species, and is now rather out of date, predating as it does DNA technology and quantitative phylogenetic analysis. 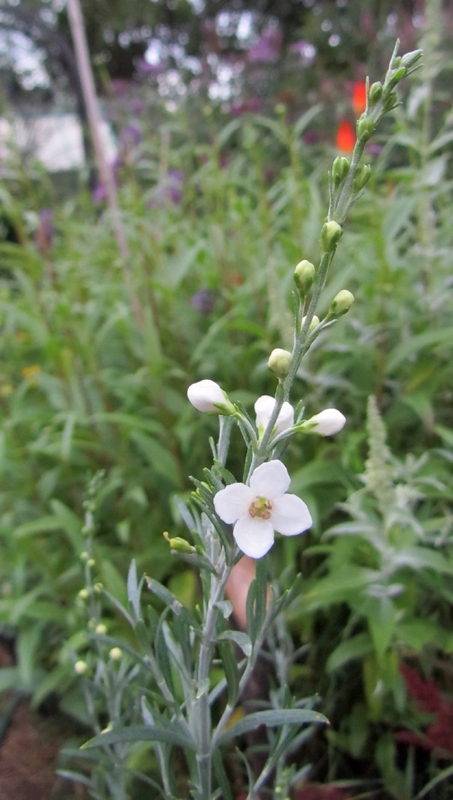 I am not entirely confident with the identification of this particular plant - I think it is possible this one is, in fact, a form of B. macrostachya (a very variable species), although I am without an authentic B. paniculata (which is uncommon in cultivation) to compare it with. My reasoning is that the flowers are rather more fleshy and the corolla tube is wider than Leeuwenberg would suggest for B. paniculata, whose flowers should more resemble those of B. officinalis. The exterior of the corolla tube is tomentose (that is, looks velvety when magnified) and the interior pilose (fewer erect, spikey hairs), but these features are common to both species. The most convincing argument for my identification is that the stamens are inserted very close to the mouth of the corolla tube and are on short filaments - those of B. paniculata should be further inside the flower and sessile (virtually no filament). One feature usually found in B. macrostachya is quadrangular and winged stems - this plant's stems are not winged at all, although the foliage is similar to several plants I have in the macrostachya/forrestii group. The identification could be settled unequivocally by karyotyping - counting the chromosomes. B. macrostachya is hexaploid and has three times the number of chromosomes (114) of B. paniculata (38). A change of subject - watch out for these nasty little beggaresses. 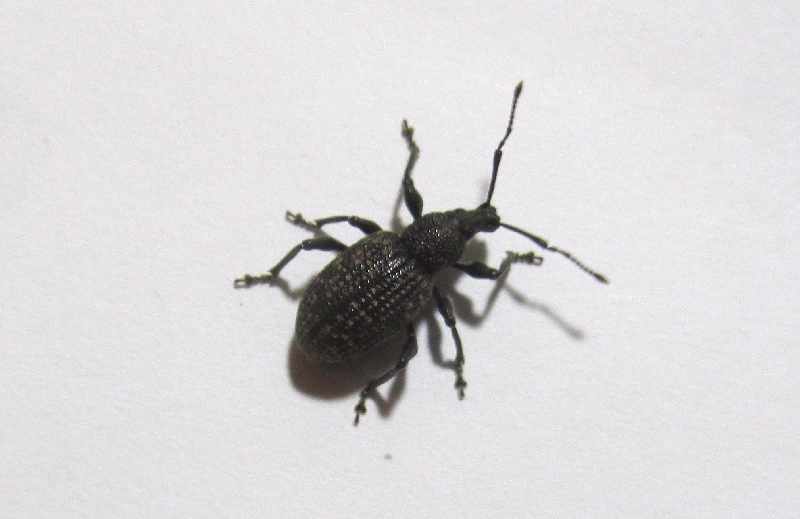 All adult vine weevils are female and they are about a centimetre long, causing only cosmetic damage to foliage. But their larvae spend the winter eating the roots of our most precious plants with often fatal results; those in pots are most vulnerable. Eggs have been laid and are hatching now. Treatment with nematodes (e.g. : Nemasys Vine Weevil Killer) is the preferred method of control, avoiding systemic pesticides which will contaminate the nectar of Buddlejas. This plant is a bit of a mystery. 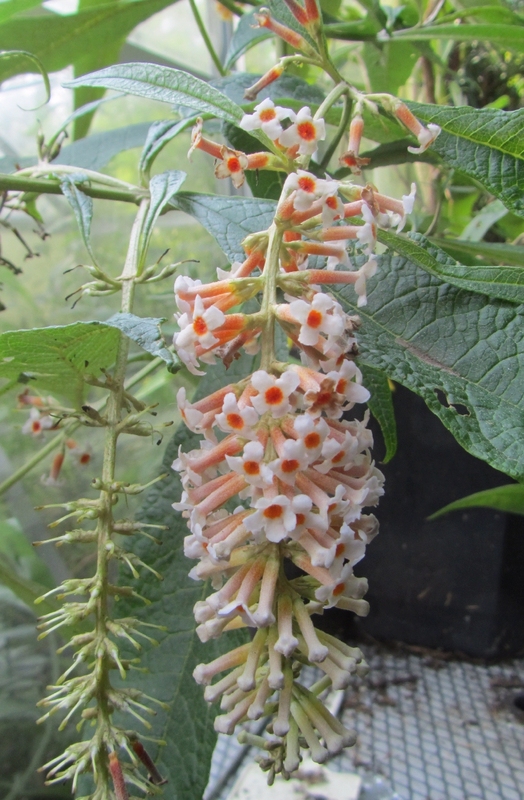 I have found out Buddelja Dreaming Orange is a plant bred by Peter Podaras (currently an independent plant breeder in Oregon, USA), who was responsible for both the Flutterby plants and the other members of the Dreaming (Hinebud) Buddleja series. Unlike these, Dreaming Orange has not been patented in the USA and information is scarce. My information is that it is a hybrid between Gomphostigma sp. 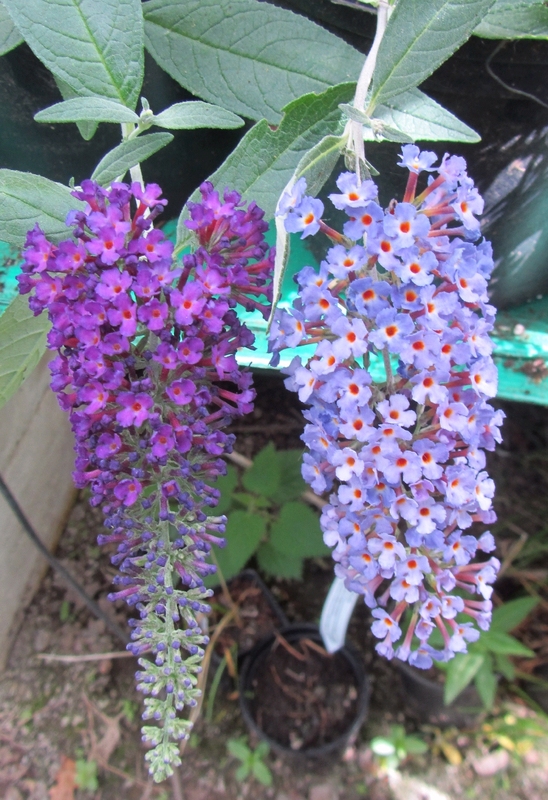 (see below) and an unnamed Buddleja hybrid. From the shape of the narrow, toothed foliage and the flower colour I would guess it was a B. marrubiifolia hybrid. 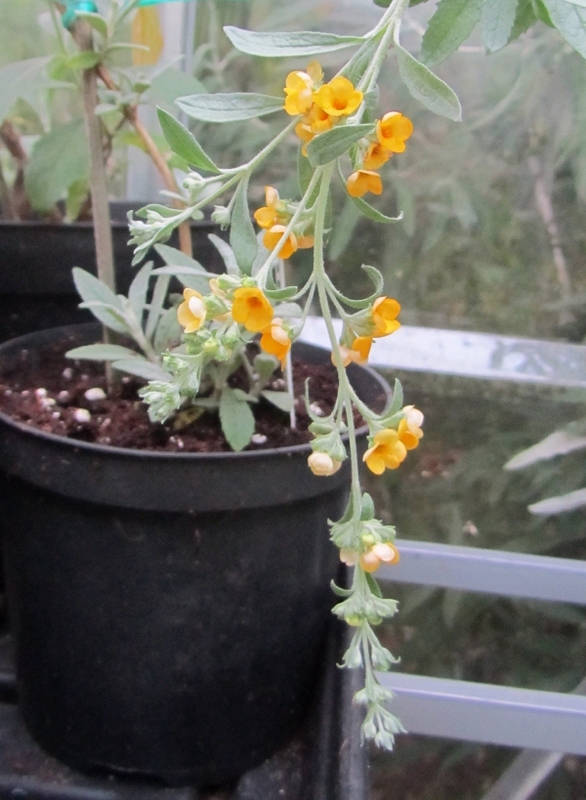 The flowers of Dreaming Orange are flat (no corolla tube), like Gomphostigma. The plant has a lax habit and the flower spikes hang down under their own weight, very unlike Gomphostigma. I am not sure whether this plant will prove hardy in the UK climate. Time will tell. However, it is an intergeneric cross that I would not have believed possible. Dreaming Orange is available from Seiont Nurseries (wholesale only). 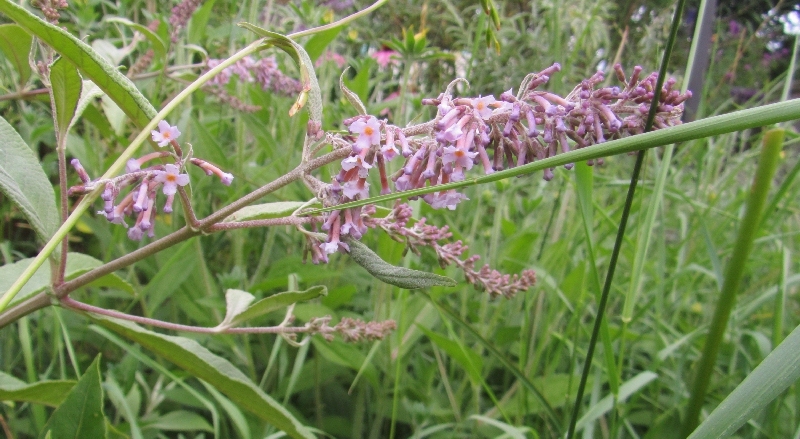 Buddleja species cross readily. The Asian species in particular naturally form hybrids with other species in their location and intermediate forms abound. When you grow a few different species in a garden and collect the seed, the chances are the resulting seedlings will be hybrids. The exception is when a species is highly self-fertile, Buddleja farreri for example - producing crosses from these requires a little more effort. 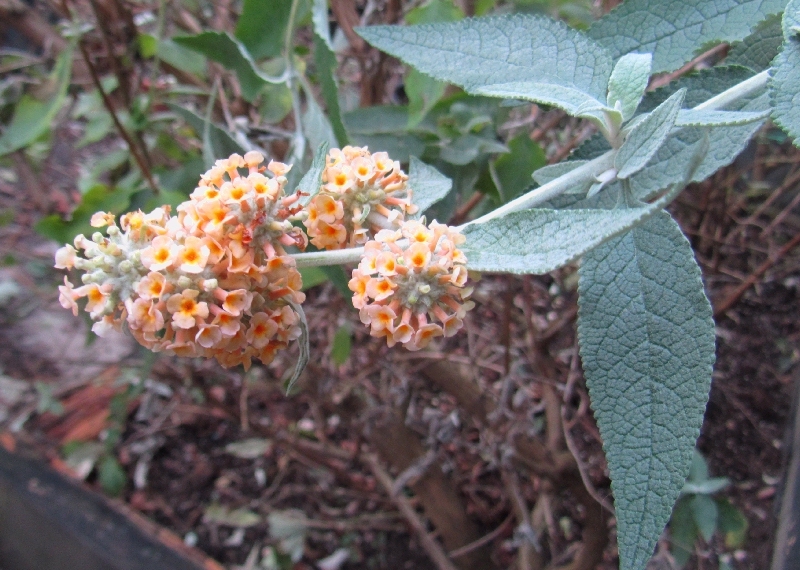 Buddleja limitanea is considered a form of B. forrestii. Although the panicles are in a different form, the individual flowers are indeed similar. I kept back a few seeds from a plant kept in a polytunnel with a couple of other plants and grew a couple of seedlings. One has the flower shown left. The leaves and stems are furry like B. nivea, although its growth habit is more like B. limitanea, and it must be a hydrid of these two species. 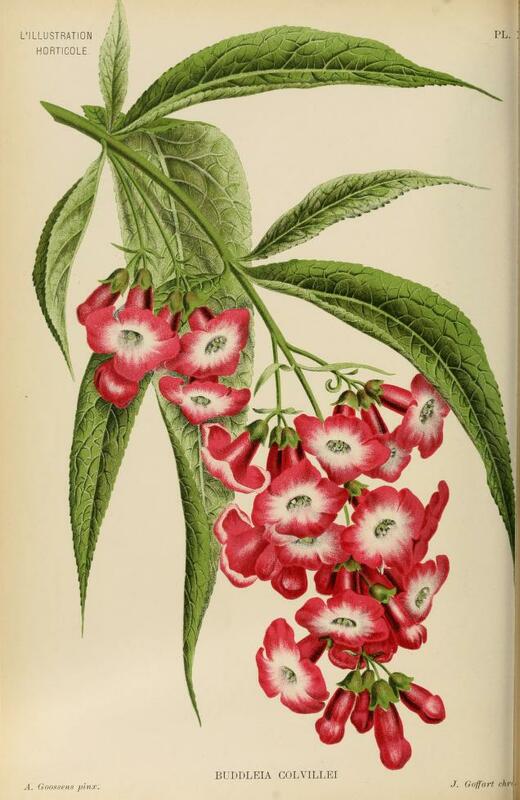 The flowers are unusual - they hang in long panicles, facing inwards, and are intermediate between the parents - and also reminiscent of B. forrestii. The corolla tube is shorter than B. limitanea and opens in a large orange eye, the opening full of hairs like B. nivea; the petals are a deep purple-mauve. For the plant to be of any horticultural merit other than for the furry leaves it would need to grow to at least just above head-height, otherwise the flowers would be difficult to see. No such worries with the plant shown below - which I believe to be B. limitanea X (B. albiflora X B. davidii). Ugly little flowers on an ugly little plant. The flower panicle is an intermediate form, combining the worst features of each parent. 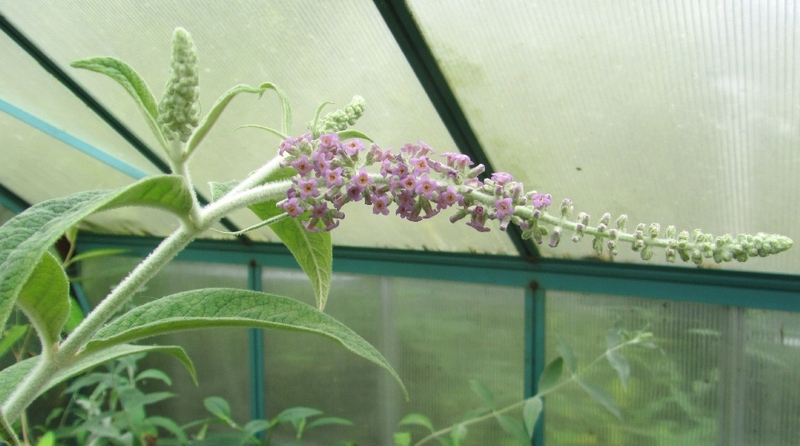 Interesting as a curiosity only, it is remarkable how easy it is to combine three species; this promiscuity could be one explanantion for the high level of diversity and/or variance amongst the Asian Buddlejas. Another species lost to taxonomy, B. stenostachya is considered a form of B. nivea, although it is still treated by horticulturalists as a separate entity. Much like B. nivea, it has furry stems and leaves, although the latter have smoother edges compared B. nivea. The inflorescences are in narrower panicles - stenostachya means narrow flower spike - and up close the flowers are virtually identical to B. nivea, with a short corolla tube and pilose (with erect hairs) in the upper part. The flowers are no more showy than B. nivea, but it is for the foliage that these plants are generally grown, especially the giant 'yunnanensis' variety of B. nivea. It would seem that B. stenostachya is indeed no more than a variant of B. nivea, which is in any case a variable species. 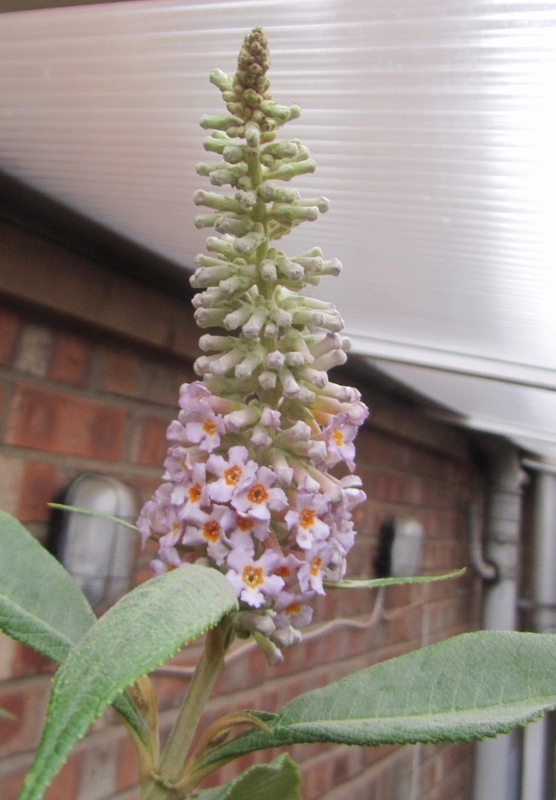 I have found Asian Buddlejas to be extremely promiscuous - it could just possibly be a hybrid of some sort. 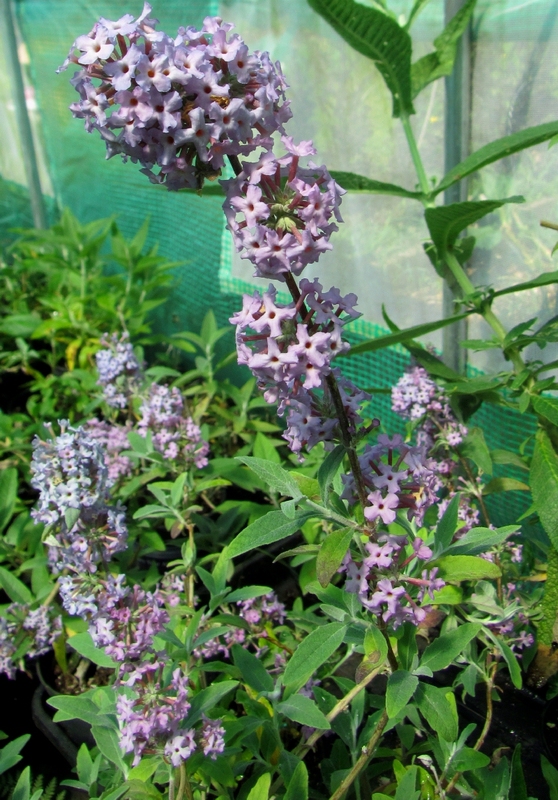 Peter Moore, curator of the Buddleja collection at Longstock Park Nursery, has bred several interesting Buddlejas. One of his most recent creations to be released is called 'Unique', and very unusual it is. My understanding os that it is a hybrid of B. alternifolia and the plant labelled as B. caryopteridifolia, which I believe is actually B. x wardii, possibly a B. alternifolia hybrid itself. 'Unique' has mostly alternate leaves and flowers in the spring in a manner very similar to B. alternifolia. The growth habit is smaller and less straggly than the parent and, so far, it is making a neat, small bush. Where 'Unique' really scores is that it repeat flowers. B. alternifolia is impressive when blooming, but for much of the year has little interest; 'Unique' is completely sterile and is unable to form seeds, so will repeat or even continually flower until winter causes it to go dormant. The flowers themselves are unusual. The later inflorescences that come after the first flush in spring are terminal, unlike B. alternifolia. And each individual flower has pointier purple petals with a darker, central stripe apparent at close quarters. 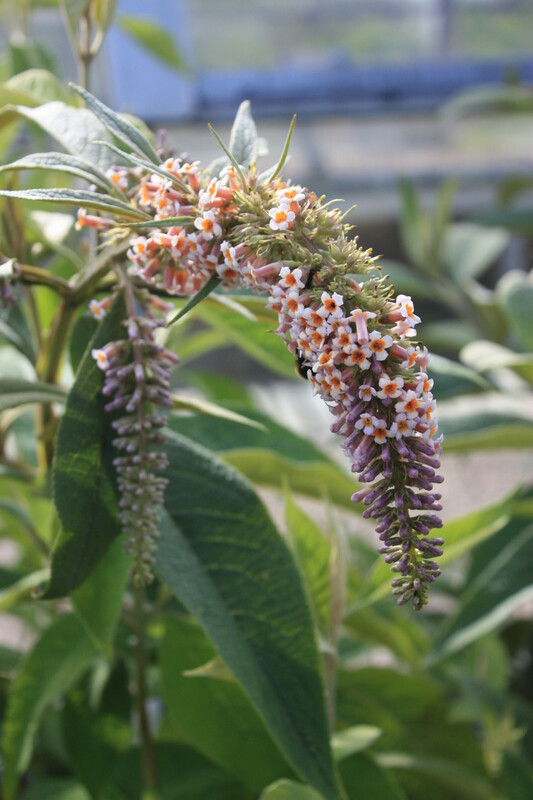 Buddleja forrestii has finally flowered; this particular cultivar has long, hanging panicles of off-white flowers with a large yellow eye. The earwigs have chewed holes in most of the long, strap-like leaves; fortunately, the flowers are unaffected. Correctly identifying Buddleja species can be tricky, and B. forrestii can be hard to distinguish from B. macrostachya. 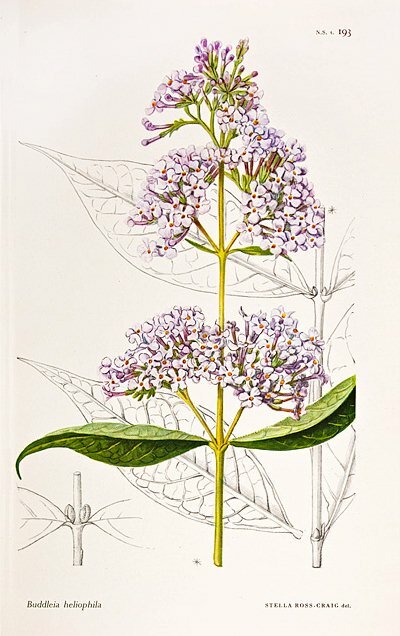 Leeuwenberg in his monograph on the Asian and African Buddlejas (1979) sunk many plants into these two species, including B. limitanea, and hence they can be highly variable with respect to flower colour, inflorescence shape, size and growth habit. The only way to tell the two apart is to make a close examination of the flowers with a magnifying glass. B. macrostachya usually has many more hairs on the outside of the corolla tube and also on the inside. In addition, when the ovary (where the seeds will form) starts to ripen it is covered in hairs. B. forrestii flowers, on the other hand, have fewer hairs inside and outside, and the ovary is glabrous (hairless). B. macrostachya flowers also tend to have a slighty longer, cylindrical corolla tube, whereas in B. forrestii it is likely to be shorter, fatter and more conical. Closely examining a single flower from the panicle shown has convinced me this plant is correctly labelled as B. forrestii. Now I have to wait for one of the two B. macrostachya cultivars I have to flower so I can properly compare the flowers. 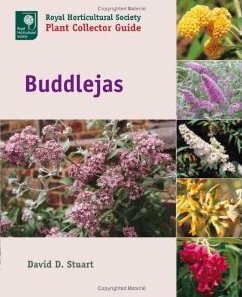 When is a Buddleja not a Buddleja? When it's Gomphostigma virgatum. 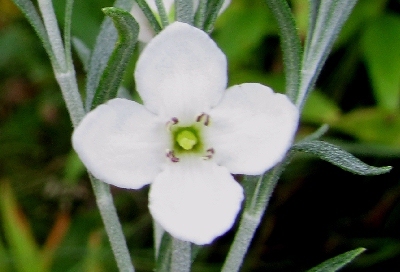 Also called Otterbush and the River Star, it hails from South Africa, where it grows alongside rivers. 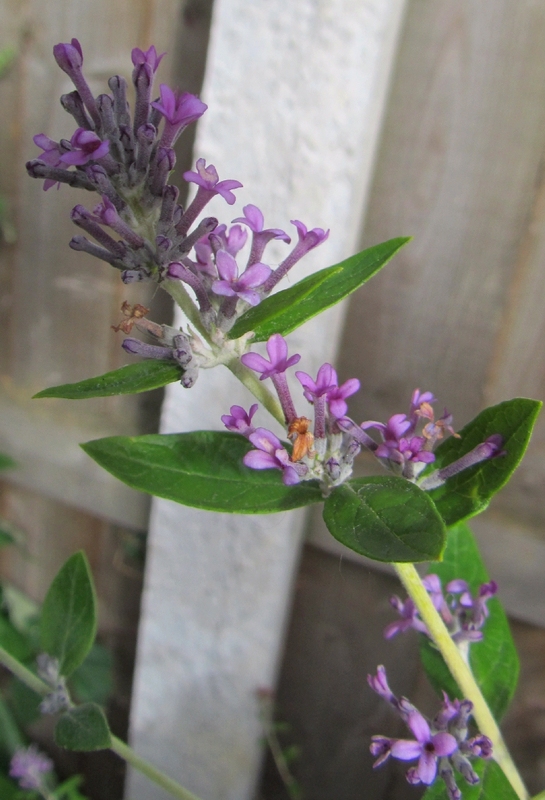 Okay, it doesn't look much like a Buddleja, with narrow foliage more like lavender or rosemary. And the flowers are larger and flatter. But they do have the familiar pattern of four petals and almost-sessile, bi-lobed stamens. It may even represent the ancestral Buddleja. 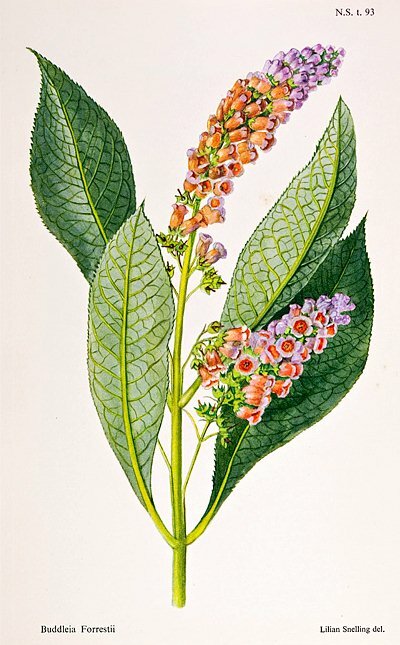 There are only three genera in the tribe Buddlejeae: Buddleja; Emorya; and Gompgostigma. Emorya consists of one, maybe two, species and is a rare shrub of North America, phylogenetically most likely belonging to genus Buddleja. 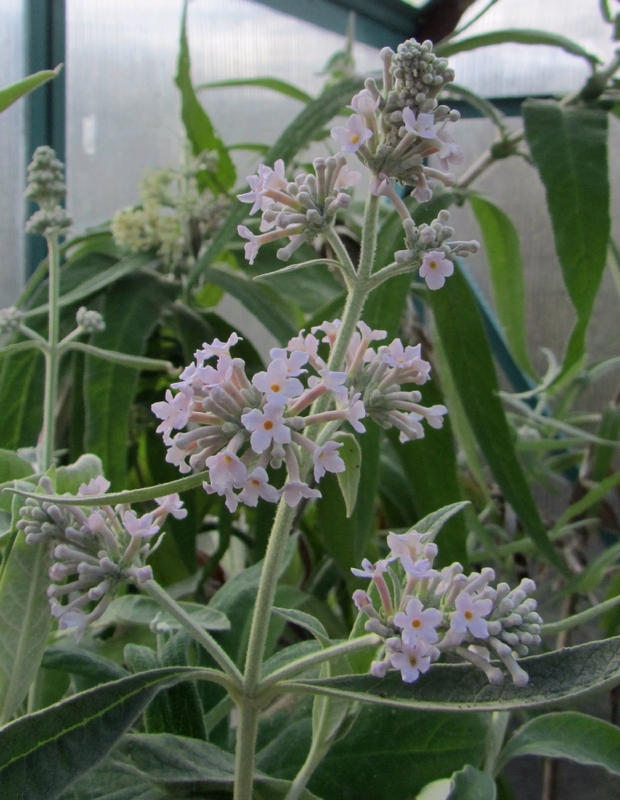 So here it is: Gomphostigma virgatum, the only Buddleja that is not a Buddleja. 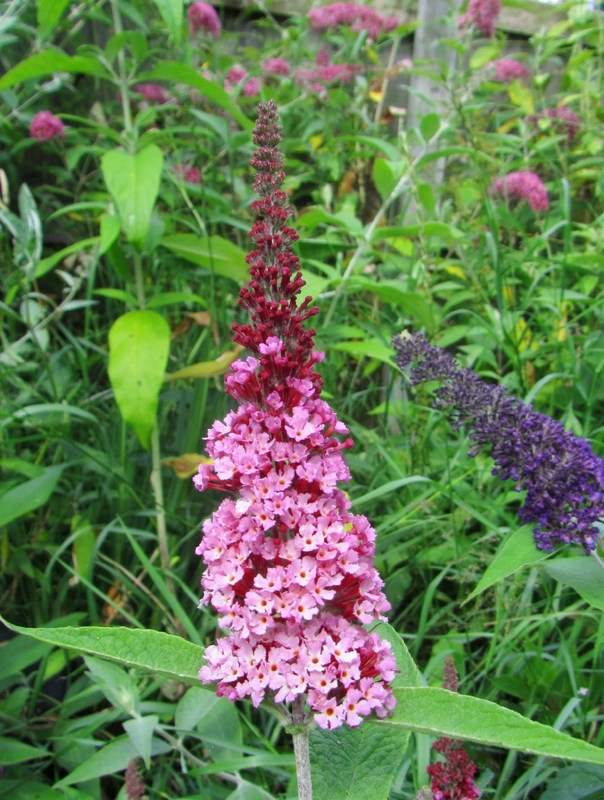 Generally, the new super-dwarf Buddlejas hybrids fail to impress in a real garden situation. Purple Splendor (syn. Hinebud 2) is proving to be an exception. It seems quite hardy, although not fully tested by the recent mild winter, and is growing quite nicely planted into the ground. At about 50cm tall, it has good foliage and long, upright flowers that are purple with a pronounced orange eye. 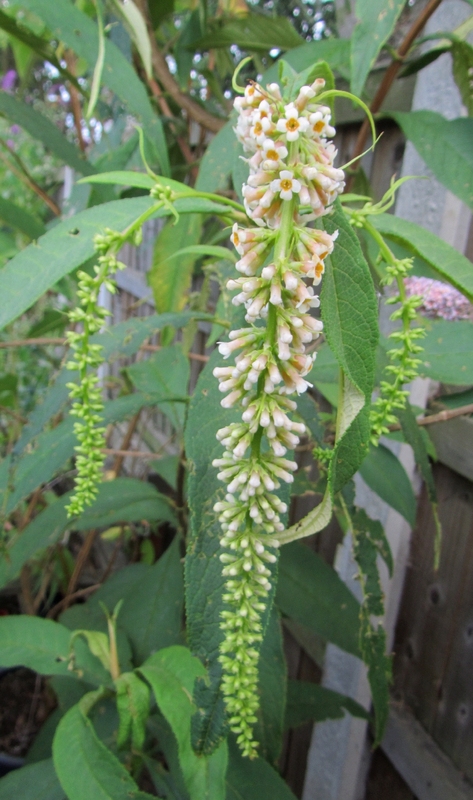 Dreaming White (syn Angel White, Hinebud 3) has flowered, and the inflorescence is predictably much like any other white Buddleja. The plant is otherwise virtually identical to its Purple and Lavender siblings, with a trailing habit and small leaves (see below). I have been growing the Buzz plants from Thompson & Morgan for several years and generally they're rather good plants. The latest addition is Buzz Candy Pink, pictured left. I rather like this one with its deep pink buds and delicate pink flowers. It's nice and upright, too. The full line-up is Lavender, Magenta, Sky Blue, Ivory, Red, Indigo and Candy Pink. There wasn't a new introduction this year. The Buzz plants aren't really small like some of the competition, like the Lo and Behold Chips and Flutterby Petites. Buzzes tend to reach about 1.5 metres in height, and 2 metres in the case of the excellent Buzz Red/Velvet. However, they are reliable plants that look and behave like full size cultivars. The same can't be said for the super-dwarf hybrids and I have been disappointed with the garden performance of many of these. I am continuing to trial new introductions and will review them once established. I should have more say on some of these as the summer progresses. Earlier this year I commented on how my B. forrestii had kept it leaves and thrived outside in the cold. Warmer weather has come and gone, and looks set to come back finally, and the plant is looking healthy, earwig damage notwithstanding. And, to my delight, flower buds are appearing just in time to develop for the warmer weather. I have never seen it flower and I don't believe it ever would've if kept restricted in a pot. Hopefully, there will be a photo of the actual open flower to follow. There are a few B. forrestii cultivars available to buy, and also several of the closely related B. macrostachya. They are often sold generically, with no collection number, and I am interested to see how the various plants compare. The problem is that they are all big plants requiring some degree of shelter, which limits the number I can assess. I have another B. forrestii currently in a pot and that looks to be a monster with huge, wide leaves. Finding that a place may be more difficult. 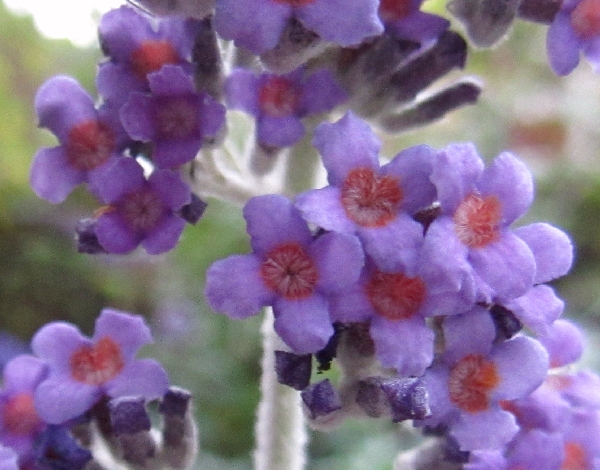 I am trying to keep track of all the new mini-Buddlejas and, where possible, try them out in my own garden. 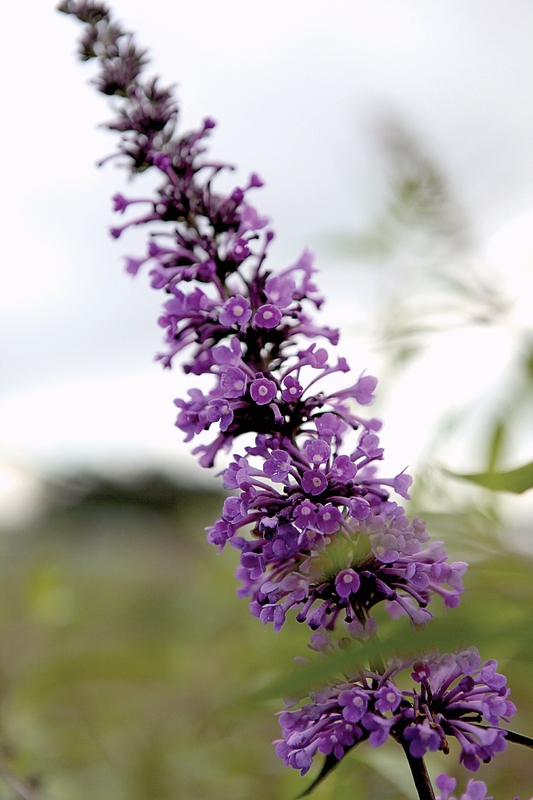 Four plants were released last year in a series called "Dreaming Buddlejas", and mostly go by different names in the US. These are Dreaming Lavender (syn. Lavender Veil, Hinebud 1), Dreaming White (syn. Angel White, Hinebud 3), Dreaming Purple (syn. Hinebud 4), and Dreaming Orange (a bit of a mystery!). All are tiny and have a rather lax, creeping habit making them suitable for hanging baskets. I don't know how well they will perform in a border so for now I growing them in pots. So far, Lavender and Purple have flowered. Both are a pleasant colour with decent foliage and look quite promising, far superior to the awful Flutterby Lavender Flow. I hope to be able to show the other two, White and Orange, flowering later in the summer. There is more information on all the hybrids bred by Peter Podaras HERE. The plants were kindly provided by Seiont Nurseries. 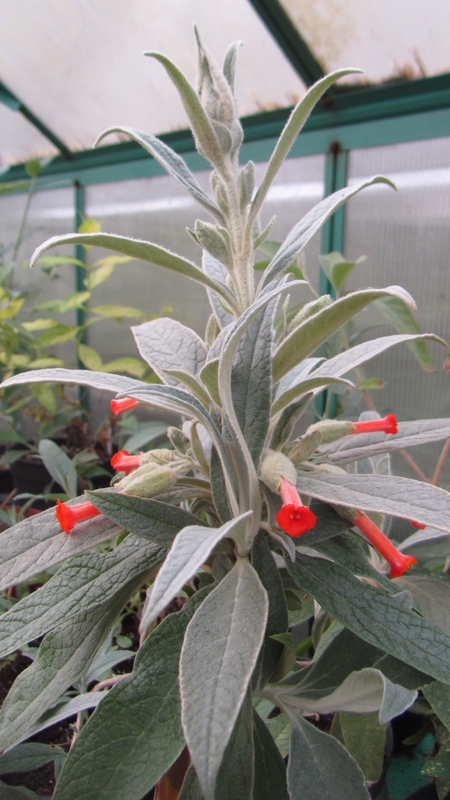 My experience of South American species had been limited to B.globosa, that is until I received a Buddleja speciosissima. It's something very different indeed. 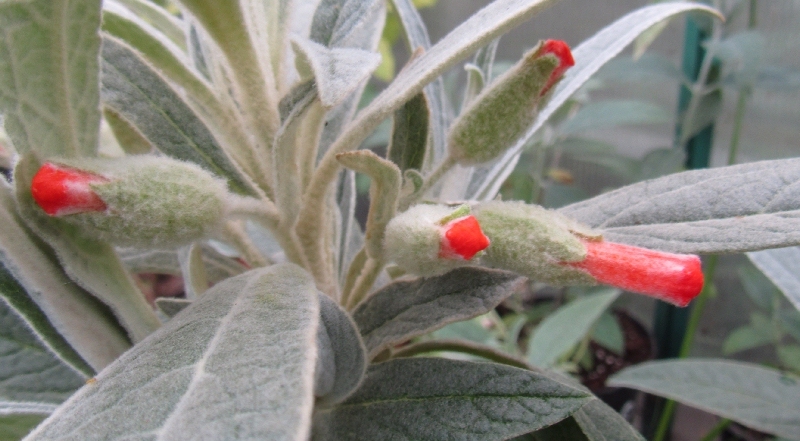 The long, tubular orange flowers are about 2.5cm (1 inch) long and emerge slowly from soft, furry buds, and it has grey, felted foliage looks quite robust. The species is from southern Brazil and has a very small range, restricted to Mount Itatiaia and growing at an altiude of 2000-2500 metres. A closely related species, B. longifolia, grows on the Serra Caparao. Despite its tropical origins, it has evolved for mountain conditions and I have been told it has proved fully hardy on northern France, forming a fairly low, scrubby shrub. My thanks to Nick (Pan Global Plants) for obtaining this plant for me. Buddleja heliophila, also known as B. delavayi, isn't a very well known Buddleja, which is a pity because it is an interesting shrub and the flowers have a wonderful rose/honey scent. Hardiness is suspect, but I would guess it would be fine against a south-facing, sheltered wall. Unlike most of the genus, it will flower twice a year: once in spring and again in autumn, with flowers that are slightly different in each season. When fully mature, and in a good year, the autumn panicles are supposed to be larger. I have yet to see mine to re-bloom, although this year the spring flowers are profuse, a sign the plant is establishing at last. I will dead-head thoroughly and feed with a high-potash fertiliser (probably pot it on, too) to try to coax it to produce autumn flowers. What a difference a week makes! Last week there was snow on the ground, this week it's twenty celcius plus. And everything is finally kicking off. Longstock Gem is a hybrid of B. agathosma and B. alternifolia and is in flower now, the same time as B. agathosma, earlier than B. alternifolia. The flowers are more purple than the pale pink B. agathosma and the foliage is smaller too, sometimes alternate. B. sterniana, another of the B. crispa complex, is also blooming now. It's very like B. agathosma on a smaller scale, although mine has thrived in the open and grown into a huge, straggly shrub. The pale pink flowers have a pleasant scent, perhaps even finer than its larger cousin. B. sterniana, one the species sunk as B. crispa, flowering in the spring sunshine. The flowers of Longstock Gem are intermediate between the parent species. 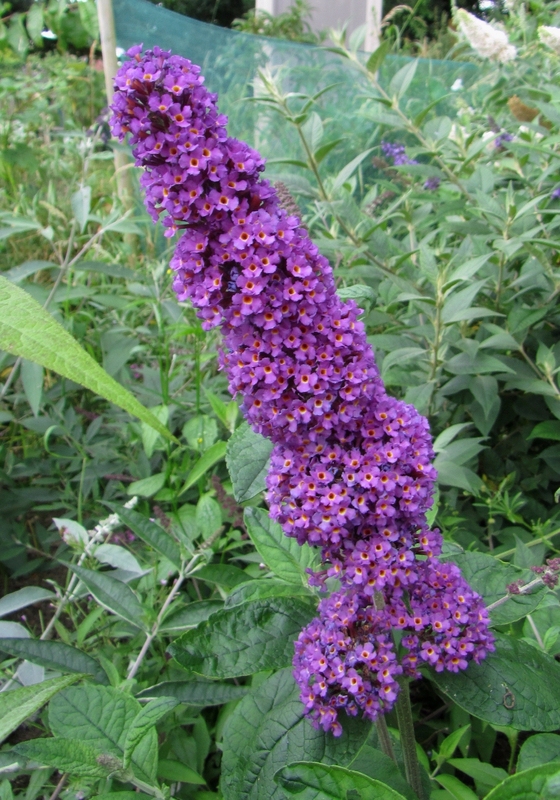 I have been growing Buddleja limitanea for a few years but have only recently tried its big brother Buddleja forrestii. The usual advice is that these two need a sheltered site and are not fully hardy if temperatures drop below about minus ten celsius. Recent winters have been mild and have offered an opportunity to establish these plants outside - when mature they are hardier. In any any case I couldn't keep B.forrestii in my tiny greenhouse as it was hitting the ceiling by May, meaning I have not seen it flower. So I planted it out last autumn. Recently, the weather has been terrible. I woke up on the First of May to see snow on the ground! B. davidii cultivars are still pretty dormant and what new growth there is has been hit by the cold winds. And yet, as with B.limitanea, B. forrestii has continiued to grow, keeping all its leaves and showing the vigour reported for this species. Its large leaves are a healthy green and unaffected by the cold, probably an adaptation to its native high altutude habitat. Here's hoping it will put on enough growth to flower this summer despite the late start to the spring. It seems spring has been put on hold, with cold weather persisting until the end of April. 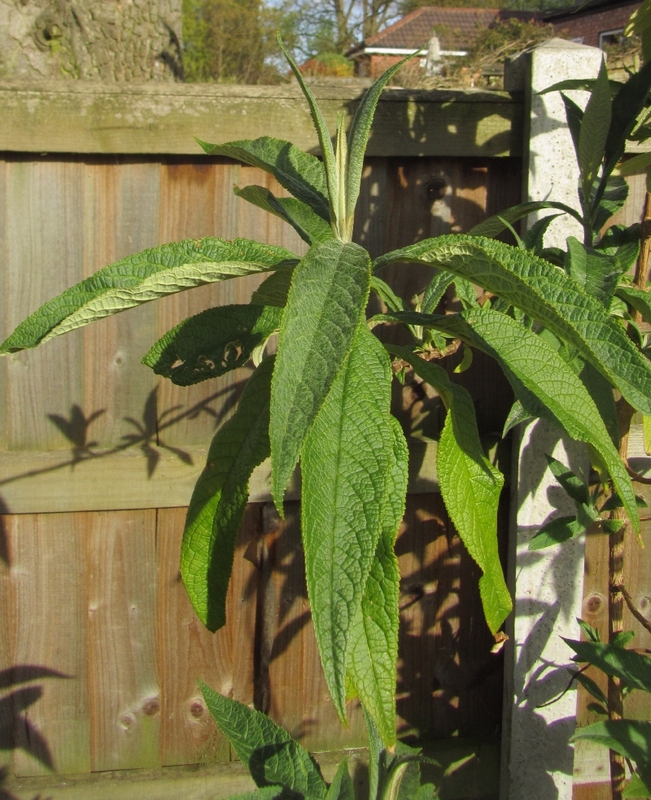 Most Buddleja davidii plants seem to be in hibernation and have barely started regrowing since they were pruned a couple of weeks ago. We have had no proper winter and then it snows in mid-April. The unseasonal late cold and frosts may shorten the Buddlejas' growing season, but they always seem to catch up once the sun shines. I have many plants still under cover because cold winds are expected again this weekend. 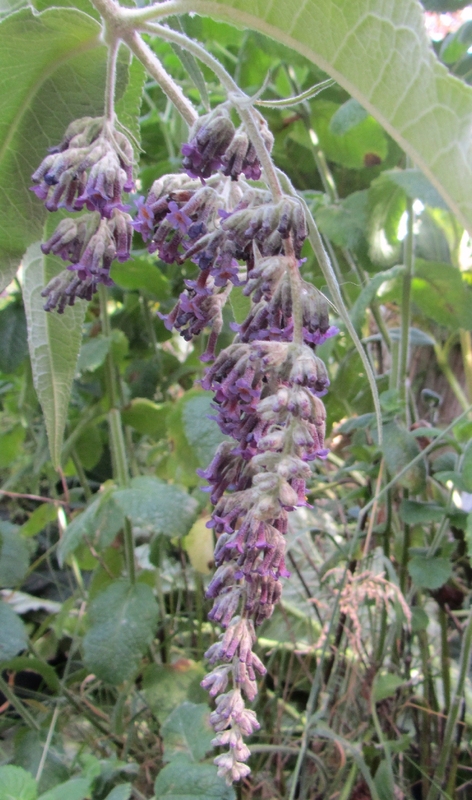 It's far from ideal as even the less hardy Buddlejas would prefer to be in the open air. Some of the tender species have to be grown in pots that can be brought inside for the winter, however it is always better to try and grow borderine hardy plants outside in the soil where possible. 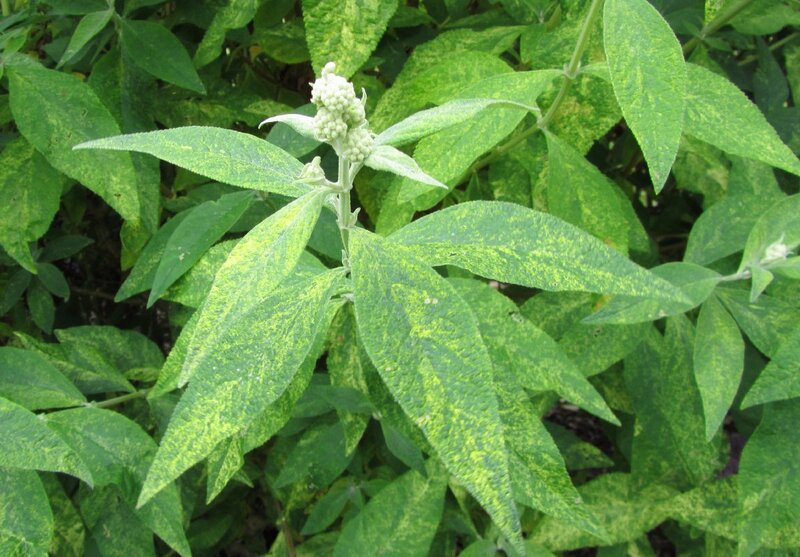 This has proved the case with Buddleja limitanea. 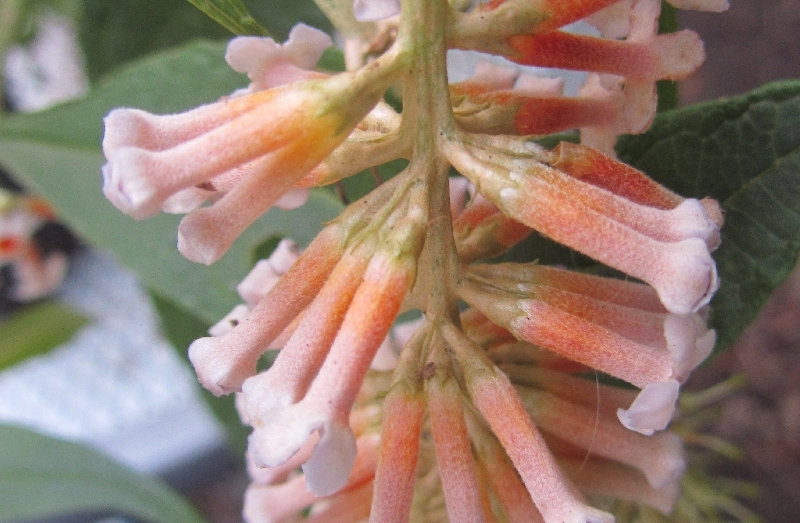 This species is often considered as a small variant of B. forrestii, an Asian Buddleja that can reach small tree proportions. Fortunately, B. limitanea is on a similar scale to a medium-sized B. davidii, 2 metres or so if pruned in the spring. It has proved much hardier than expected, growing on a warm but exposed slope. In case of a very severe winter, I keep a spare in a pot that can be moved into my polytunnel. The one grown outside is a much healthier specimen. 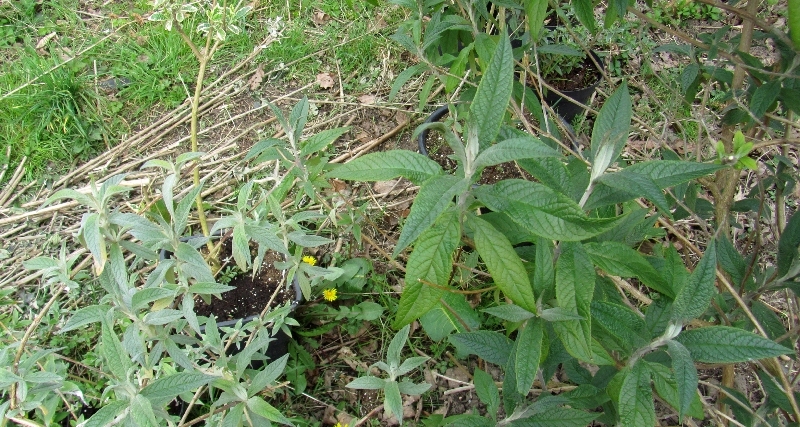 In the first photo the plant in the foreground is the pot-grown example, kept in a polytunnel over winter. It's in a large pot - 50 litres - so it's hardly cramped. Behind it is one planted out 18 months ago, and it had been through two winters. It is much bigger and much healthier. In the second photo you can see that the foliage on the outside grown specimen (right) is so much more lush, large leaves that are a deeper green compared to the pot-grown one (left). The two plants were cuttings taken the same day from the same plant. This really illustrates how much better it is to plant in the ground, allowing plants to grow to their full potential. Space permitting. 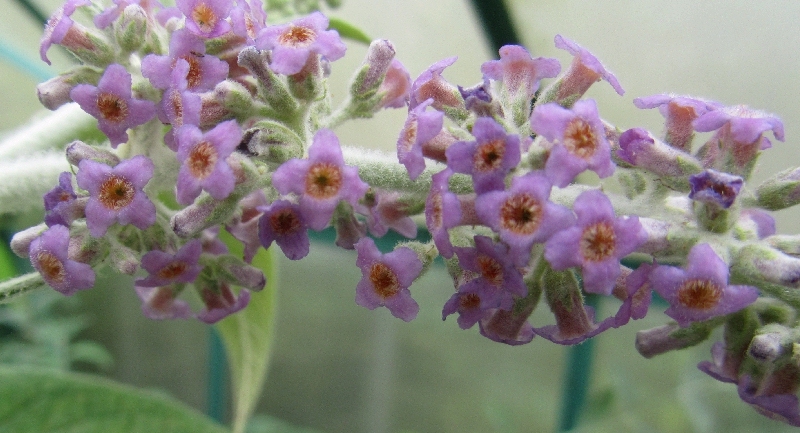 Buddleja Argus Velvet (syn. Inpired Violet) is now available in the UK from Thompson & Morgan. 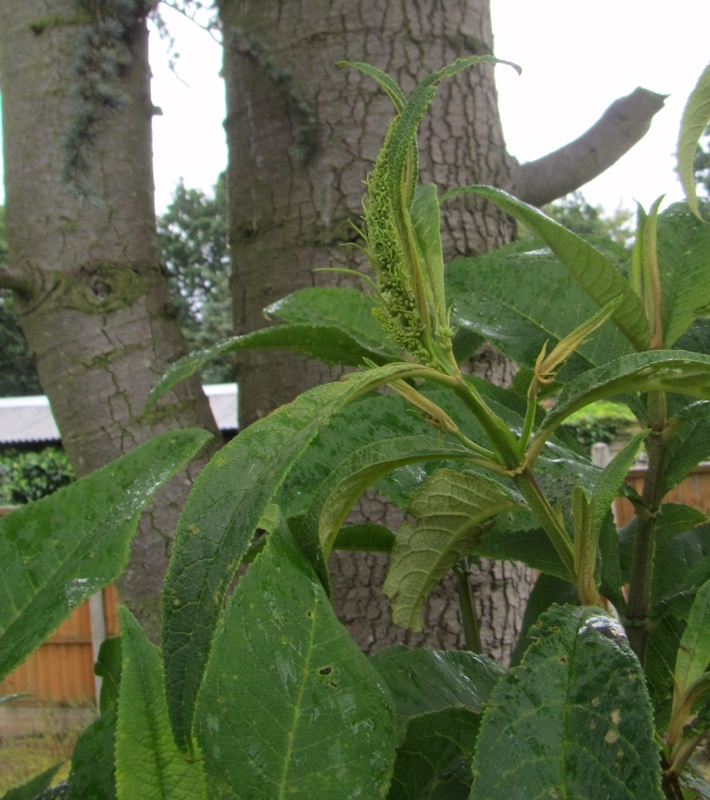 It is a sterile hybrid of B. lindleyana and B. davidii bred by Katrijn van Laere (Institute for Agricultural and Fisheries Research, Belgium) and forms an arching shrub much like B. lindleyana and with similar foliage. The flowers, however, are more spectacular: the flowers have bright, white eyes and a curved corolla tube that is unlike B. davidii. I look forward to growing this interesting plant. Every now and again a sport of a known cultivar will arise, a shoot that is in some way different to the reast of the plant and can be propagated vegetatively. 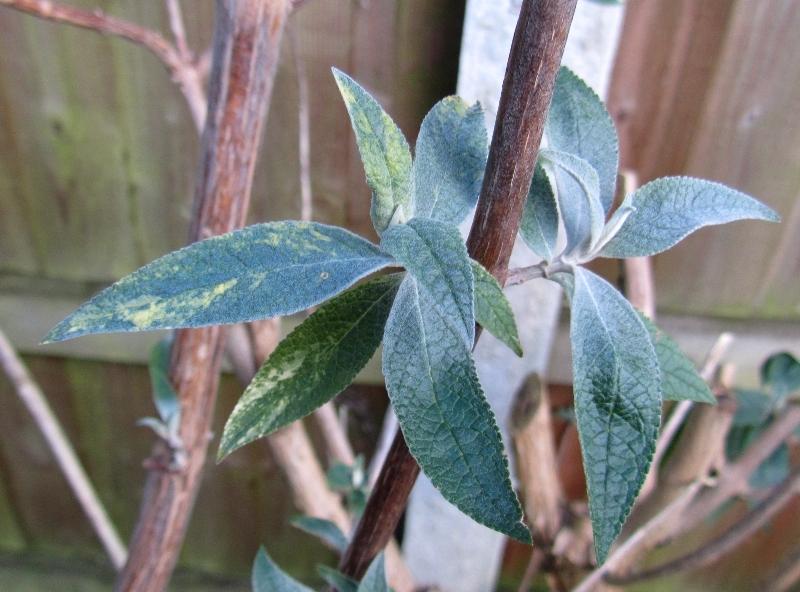 The variegated Buddlejas are usually such sports and I have had one arise in my garden, a variegated shoot on Moonlight. It is early days; I have yet to propagate new plants and prove its stability. The variegation is much like the relatively unknown B.x weyeriana variegata, a sport of Sungold, yellow spots and patches rather than neatly along the leaf margins. It is nothing special but none the less worth a go. Most years Buddleja officinalis is the first to flower in the Buddleja Garden (see right). Normally, here in the Midlands and under cover, it waits until March to flower, holding the buds fully developed but dormant all through the winter; the reason I don't plant mine outside, the chances of the buds surviving the frosts are quite low. This year it had flowered two months early from my point of view, starting mid-January. It's not the only one to be so early. Buddleja salviifolia Alba has also started to open its buds, those that survive the Botrytis that the mild and damp weather allows to run riot. And the normal blue-flowered form is close to flowering too, a full three months early. The Diary returns with a new colour scheme. And with a photo of Salmon Spheres taken in what should be the depth of winter. This hybrid is considered borderline hardy although mine is thriving outside. It has been growing visibly throughout December and is still in flower now. I have also been told of Buddleja officinalis shrubs in full flower in Central London during December. The weather has been interesting, and that is using interesting in the same sense as the old Chinese curse: May you live in interesting times. Records have been broken, warmest November day, warmest December night, record rainful and floods. Not to mention the wind. The lack of a proper frost is both good and bad news: good because tender Buddleja are more likely survive a mild winter; bad because pests and diseases aren't controlled by the seasonal freeze. Many normally deciduous Buddlejas still have their leaves, that is where the howling winds haven't blown them away; slugs are still active and I've seen shield bugs about during this week. And then there is the rain, endless rain, the ground is more than saturated already and more is to come. Under cover the warm and damp conditions mean Grey Mould (Botrytis) is a real problem; the only solution is good ventilation. Who knows what will follow, although it seems likely that the Atlantic storms will continue for the time-being. The Diary should start in earnest in the spring, whenever that may come; it's only a couple of years since we had snow on the ground in late April. In the meantime, here are a few antique prints to enjoy; click to enlarge.